The Star of India when built was an experiment for she was built with iron instead of wood. She was built in the Ramsey Shipyard in 1863 on the Isle of Man and christened the Euterpe after the Greek goddess of music. Her initial voyages were ill fated. During her first voyage she experienced a collision and mutiny. During her second voyage she encountered a cyclone in the Bay of Bengal that cut off her topmasts, she barely made port. After this her captain died and was buried at sea. For the rest of her sixty years plus in service her voyages, excluding accidents, were relatively calm. She made six cargo runs to India before 1871, then she was enlisted to sail emigrants to New Zealand, Australia, California, and Chile. It was during this time in 1884 that a young teenage stow away named John Campbell snuck aboard in Glasgow. The Euterpe was headed for New Zealand and Campbell was hoping to exchange a life of poverty for a life of adventure. When Campbell was discovered, the crew put him to work for his passage. Tragically in June of 1884 Campbell fell from the main mast as he landed he broke both his legs and was knocked unconscious. Three days later he passed away and was buried at sea. Today witnesses have reported seeing him near the main mast on all decks of the ship. He has also been spotted hiding among the various chests in the ship’s cargo hold. Other reports state that several visitors to the Star of India have felt a cold hand touch them while they were near the main mast. By the year 1898 the Euterpe was sold to Alaskan Packers who used her as a commercial salmon fishing and packing facility. In 1902 her name was changed to the Star of India. It was during this time another accident happened on board. A Chinese seaman got caught in the chain room while the anchor was being raised. The noise of the rising anchor was so loud his cries for help were not heard. Unfortunately, he was crushed and killed by the rising chains. His ghost is said to haunt the Star as well. By 1923 the Star of India being outdated was bought for $9,000 and towed into San Diego bay. The new owners wanted to restore her but the Great Depression and World War II got in the way. The Star fell into disrepair and was briefly used as a floating brothel. It wasn’t until 1976 that she was finally restored to her original splendor. Today the Star of India is apart of the San Diego Maritime Museum and is still put out to sea at least once a year; this makes her the oldest active ship in the world. Besides the Star’s two resident ghosts other strange phenomena has been reported over the years. Human outlines have been seen on beds where no one is sleeping. Pots and pans move of their own accord in the ship’s galley and the smell of fresh bread is often detected even though the galley is no longer used for cooking or baking. Several witnesses have also reported hearing voices and footsteps below them when no one is there. Shadow figures have also been seen. In recent years the museum has hosted Spooky Seafaring Tales and ghost tours on the Star of India close to Halloween. For almost two centuries a mysterious light has haunted an area where Oklahoma, Kansas, and Missouri converge. This light is described as a very bight shimmering orange ball that remains bright even when seen from a distance. Witnesses state that this ball of light bobs and weaves its way very quickly down the center of a graveled Oklahoma country road and then bounces up among the treetops and simply vanishes. The light always appears on one stretch of road known as “Spooklight Road’ or the “Devil’s Promenade.” This phenomenon occurs on a nightly basis between the hours of 10:00 p.m. and midnight. Over the years both paranormal and scientific investigative teams have tried to solve this mystery. In 1946 the Army Corp of Engineers did an investigation. They studied the phenomenon for three weeks and walked away baffled. Their official report listed the light as “a mysterious light of unknown origin.” In 1965 the magazine Popular Mechanics sent a reporter and photographer to investigate the light. When this article was published it stated that the cause was car lights on U.S. 66 ten miles from the Devil’s Promenade. Soon afterwards, many local residents pointed out that the light was seen for many years before there was a highway or cars. Another explanation for the light is listed as escaping “natural gases.” But the light doesn’t appear to be affected by wind or rain, which does impact natural gases. It is also pointed out that natural gases rarely appear with the same intensity of light that is seen along the Devil’s Promenade. The light is so bright that residents twelve miles away in Joplin, Missouri can see it. Yet another explanation is that the light is a result of an electrical atmospheric charge, the problem with this explanation is that this type of charge is normally associated with earthquakes. One interesting part of this light phenomenon is that it shies away from large crowds of people and it reacts to loud noises. Natural gases and electrical charges would do neither of these things. Witnesses have reported that the light has entered their cars or even followed or chased them as they walked along the Devil’s Promenade. When this has occurred these witnesses have stated that this light radiated quite a bit of heat. After World War II stories about the Spooklight began to spread to other parts of the country. 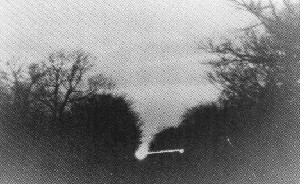 In the 1960s and 1970s this phenomenon became so popular it was not unusual to see the Spooklight Road packed with vehicles and people hoping to catch a glimpse of this mysterious light. Today there is a web site, blog, and a twitter page all devoted to publishing recent eyewitness accounts. Over the years many legends have been told that provide a more ghostly reason for the presence of the Spooklight. One early legend recounts the story of a Quapaw Indian maiden who fell in love with a young brave but her father would not let her marry the young man because he lacked a suitable dowry. The young maiden defying her father eloped with the brave. Very quickly the two lovers were pursued by a group of warriors. As the couple was close to being caught they joined hands above Spring River, which is the Devil’s Promenade, and leapt to their deaths. It is said that shortly after this the Spooklight began to appear. In this tale the light represents the joined spirits of these two young lovers. There are many other legends that explain the Spooklight’s existence; one involves a miner who was decapitated in an accident. Another involves a Quapaw Indian whose wife cut off his head, while yet another is about an Osage Indian chief who was decapitated near Spooklight Road. One story told often over the years involves an army sergeant who was captured during a Civil War battle. It is said he was executed by a cannon that blew off his head. All of these legends state that the Spooklight is actually a lantern that these various victims use to look for their lost heads. I find that most unexplained light phenomenon legends have at least one good decapitation/lantern story. 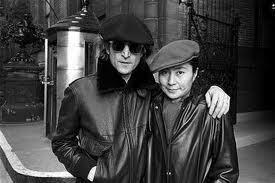 On December 8, 1980 former beatle John Lennon and his wife Yoko Ono where just returning home to The Dakota, a luxury apartment building in Manhattan, when a deranged fan shot Lennon five times in the back near the entrance to the Dakota. On route to Roosevelt Hospital Lennon died. John Lennon was 40 years old. John’s ghost has been seen at The Dakota on several occasions. 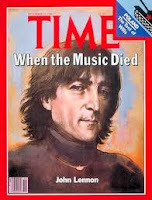 In 1983, three years after Lennon's death, Joey Harrow, a musician, accompanied by a writer friend Amanda Moores spotted Lennon near the entrance where he was shot. Moores stated she was tempted to approach Lennon and talk but his expression dissuaded her. Harrow reported that when Lennon appeared an eerie light surrounded him. Paul McCartney stated that he George and Ringo after this knew it was John and that he was sending his approval. For over a hundred years the Blue Light Tunnel in Ontario, Canada has been haunted by ghosts. 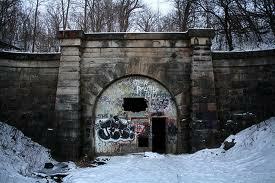 This tunnel was constructed in the mid 1870s as a part of the 3rd Welland Canal. It was first named the Merritton Tunnel because it was near Merritton, which is now is a part of St. Catharines. It was also at one point called The Great Western Railway Tunnel because it provided passage for the Great Western Railway under the 3rd Canal. This tunnel was in use until the First World War when a swing bridge replaced it. The tunnel is haunted because of a series of accidents that happened near it and a graveyard that is covered in water close by. In the early 20th century two trains collided head on one hundred yards from the tunnel entrance. The accident happened on a sharp curve where the two engineers could not see each other. These two men escaped this accident with only broken limbs but both their fireman died as a result of this wreck. It is said the ghostly spirits of these two still linger in the tunnel. Sightings of wispy fog and mists near the tunnel entrance are cited as proof of this claim. The first fireman who worked on the express train was discovered at the scene of the accident dead. His body was found crashed between the boiler and the tentler. When the rescuers tried to recover his body his limbs broke away from the rest of his body because his mid section was wedged so tightly. The second fireman who worked on the mogul train was smashed into the boiler of the train, and received burns over 90 percent of his body; he was taken to St. Catharines Hospital where he died five hours after the accident. Another source of the ghostly activity in the tunnel is attributed to a series of accidents that happened nearby as the Welland canal was being constructed. One freak accident that occurred at Lock 6 in August 6, 1928 took the lives of eight men, just two years later on this same date eight more men were killed in another accident. It was believed that the ghosts of the tunnel cursed the area and this is why these two accidents happened. The belief in this curse and haunting was reinforced by the fact that over 107 lives were lost during the time the canal was being constructed. In the preceding years the pump house that brings water to locks 4, 5, 6, and 7 and is close to the Blue Light Tunnel experienced its own disasters. Some of these accidents were not even recorded in the local paper because it was feared if they were reported it would become known The Welland Ship Canal was indeed haunted by ghosts. Yet another source of the Blue Light Tunnel hauntings comes from a pond near the tunnel. In the early 1800s a churchyard and cemetery was established in the Thorold township. By the early 20th century this area had fallen into ruins. In the 1920s with the construction of the 4th Welland Canal it was decided that the area where the St. Peter cemetery was located would be used for a “canal pondage.” In other words they intended to flood the area with water. Of the 913 graves that were in the area when this decision was made only 250 were claimed by relatives, the rest it was decided would just be left in place. So 663 graves remain under the pondage area near the Blue Light Tunnel. Many of these lost souls are said to still haunt the tunnel today. Many believe because of so much tragedy the Blue Light Tunnel has acted as a magnet for all who died in the area around it. Because of the documented activity in the tunnel many are even afraid to enter it. Footsteps, whispered conversations, and old-fashioned music have been recorded in the tunnel. In recent years an area near the tunnel was used as a teen party spot. In 2011 the Blue Light Tunnel was closed to the public. In the past a cinder block wall that was constructed at the entrance to keep people out was vandalized. Officials state they want to keep people out of this very old tunnel because it is located under a stream therefore it is unsafe—if a wall were to collapse water could rush in. Some feel this is not the only reason the Blue Light Tunnel is off limits. Both my parents grew up in Salt Lake City, Utah. In the 1930s my father and his friends would go to the Wasatch Mountains in Park City to ski. This is before there were ski trails or a lift in the mountains. They skied on wooden skis and a friend towed them up the mountain. 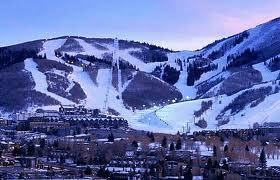 Today Park City is a ski resort and of course the home of the Sundance Film Festival. Park City is also haunted. Park City was originally called Parley’s Park. U.S. soldiers who were posted there to protect mail routes discovered silver in 1868. In 1870 Parley’s Park had 164 residents. With the discovery of a huge vein of silver in 1874 at what would eventually become the Ontario mine the town was renamed Park City. In its heyday the Ontario mine was considered the greatest silver mine in the world. This mine produced over 50 million dollars in wealth in the years it operated. 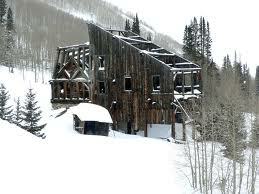 In 1892 the Silver King mine opened and eventually became the largest producer of silver in Park City. In 1896, when Utah became a state, Park City had over 7,000 residents. Few benefited from this rich silver strike. By the turn of the century the mines had made millionaires of 23 men and women. In contrast, most of the population were laborers. Hundreds of prospectors dotted the hills by the 1870s, these men would bring their wives and children later to live in Park City. The miners came from areas were the mines had already played out. They came from Nevada, Scotland, Ireland, and Scandinavia. These groups made the area ethically and religiously diverse but it also set a firm caste system in place. Within this caste system the many Chinese who had worked on the transcontinental railroad who came to Park City suffered the worst bigotry. By 1947 the mines began to close, Park City's economy dwindled and the population dropped to less than 1500 people. In the 1950s fewer than 200 miners still worked in the mines, at this point Park City was designated a “ghost town.” In order to save the town in 1963 several enterprising residents got together and decided to revive the town by opening a ski resort. When Sports Illustrated featured Treasure Mountain in 1966 Park City became more and more popular. By the time the last mine closed in 1982 the ski industry was booming. The 2002 Winter Olympics further increased the population and popularity of Park City. The town today is ranked second among North American ski resorts. During the years the mines operated there were several fires and mining accidents in the area. After a particularly bad fire in 1898, caused by canyon winds and still considered Utah’s worst disaster, two-thirds of the town was destroyed. After this the residents rebuilt using stone and brick. The town didn’t completely recover until 1920. During this time in 1902 a dynamite explosion at one of the mines caused a poisonous gas to spread killing many miners, other miners were blow apart with the initial impact of the blast. A phenomena that was noted on several occasions while the mines were still active were sightings of a harbinger. It is documented that just before several mine accidents occurred a male dressed in a yellow slicker would appear in front of a group of miners. His appearance was feared because he was considered a bad omen. The miners dread was not misplaced for bad things always happened after he was seen. Yet another phenomenon reported by miners was an evil presence that was felt and seen in the mines. Note: check out my post about mine spirits and knockers. In the Park City mines a malicious Tommyknocker was heard knocking on the lower rungs of ladders preventing miners from escaping during emergencies. As the mines closed they left behind a labyrinth of tunnels that are hundreds of feet below the surface. In recent years tours were given that included the history of these abandoned mines. 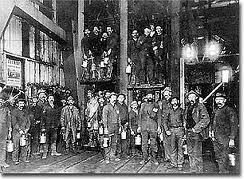 * After the dynamite accident that occurred in 1902 several witnesses came forward to report a gruesome sight--what they saw was the ghosts of these miners near where they died looking for their missing body parts. One specific ghost that is seen is that of a woman. She has long blonde hair and is often spotted riding a horse. Her ghost is also seen in one mineshaft at the 200 feet level. It is speculated she was one of the few fortunate millionaires. Various other apparitions are seen wandering the tunnels as well. * There are still ghost tours given in Park City but the tales they share do not always include the traditional ghost mine stories told above. Much has been written about Eastern Airlines Flight 401 that crashed in the Florida Everglades in December of 1972. Every time I encounter this story chills run up and down my spine. The reason for this is because this story is about ghosts that were seen multiple times by people who knew them before they died. What is even more impressive is these hauntings were well documented despite an attempted cover-up. When this wide-body L-1011 jet crashed, it killed 101 people. 77 people survived the crash. All but 17 of the surviving passengers and crew sustained significant injuries. Among the dead were the pilot Robert ‘Bob’ Loft and the flight engineer Donald ‘Don’ Repo. Two of the ten female flight attendants perished as well. The crash happened as the plane neared its destination-- Miami International Airport. After the crash, it was determined the cause was the flight crews’ failure to recognize that the autopilot, which kept them on course at 2000 feet, had been accidentally bumped and deactivated. When this happened, the flight crew were busy troubleshooting a malfunction in the landing gear. So when the plane gradually lost altitude, they were preoccupied and failed to notice the alert sound their flight instrument made, which indicated they had dropped 200 feet warning them to correct their attitude. It was at night, and they were flying over the Everglades where there were no ground lights or visual clues to warn them they were descending into the swamp. When they realized what was happening it was too late to do anything about it. Two books have been written about Flight 401, and two films were produced, but the crash wasn’t their primary focus, what they focused upon instead was what happened in the months after the accident. For a year and a half after Flight 401 went down, both crew members and passengers reported seeing the deceased Captain Robert Loft and flight engineer Donald Repo on other L-1011 flights. Most believe their presence was a result of the fact that Eastern Airlines to save money used salvaged parts from this crashed plane. They put these spare parts in other L-1011’s. It was on these planes with the salvaged parts that the hauntings most frequently occurred. Many of the witnesses who saw the ghosts were crewmembers who recognized Loft and Repo because they had known them when they were alive. There were so many sighting that the 1974 Flight Safety Foundation’s newsletter published information about it. Eastern Airlines always refused to discuss the topic, and at one point they threatened to sue the producers of the film ‘The Ghost of Flight 401’ for defamation. The reports from their employees became so prevalent they told them they could face dismissal if they were caught talking about the ghostly sightings. It is interesting to note here that even though Eastern publicly denied their planes were haunted they quietly removed all the salvaged parts from their L-1011 fleet. Today, Eastern Airlines no longer exists. The witnesses who saw the apparitions of Loft and Repo described them as very lifelike. These two ghosts did more than just appear they often spoke or conversed with the living. Several Eastern Airline crew members described in vivid detail their encounters with the spirits of Loft or Repo. These witnesses included: pilots, flight officers, and even ironically the vice-president of Eastern Airlines. This executive started a conversation with an officer sitting in first class. He believed this officer was the captain in charge of the Miami bound flight he was on. But he realized as he watched this man vanish into thin air that it was actually Loft who he had been conversing with. Most of the sightings were corroborated because there were multiple witnesses. 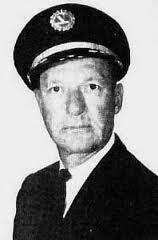 One account is of a captain and two flight attendants who reported seeing and speaking to Loft just before take off, he then vanished before their eyes. This shook them up so much they canceled the flight. Another multiple sighting occurred when a woman passenger reported her concern to a flight attendant that the man sitting next to her wearing an Eastern Airlines uniform was pale and unresponsive. This same man disappeared in front of her, the flight attendant, and several other passengers, a full report was written about this incident because the woman passenger went into hysterics and had to be calmed down. When shown a photo of Repo later this female passenger identified him as the uniformed man who had been sitting next to her. One crew member who saw Repo was a flight engineer who was doing his routine pre-flight inspection on an L-1011 that had salvaged parts from Flight 401. Repo appeared in front of him and stated, “You don’t need to worry about the pre-flight, I’ve already done it.” On another flight, a captain reported that Repo had appeared before him and assured him, “There will never be another crash. We will not let it happen.” The ghosts of Loft and Repo were never witnessed on the same flights. Both these ghosts took a hands-on role when they appeared. Repo was the more active of the two. On one occasion a flight attendant spotted a flight engineer fixing the galley oven. When she later approached the flight engineer, he stated he had not fixed the oven and that there had not been another engineer on board. This mysterious engineer was identified as Repo. On another occasion, Repo was seen by a flight engineer who was investigating the compartment below the cockpit because he had heard knocks which led him to find an unknown problem. Repo was seen yet again in another plane’s galley when a flight attendant spotted his reflection looking out at her from the galley oven. This plane’s kitchen had salvaged parts from Flight 401. Alarmed at sight, this flight attendant fetched two of her colleagues, one was a flight engineer who had been a friend of Repos and recognized him. All three witnesses heard Repo state, “Watch out for fire on this airplane.” The records show the plane did have serious engine trouble, a fire did break out, and the last leg of its journey was canceled. Recovery crews sent to retrieve the various parts of the crashed plan also reported seeing and hearing strange things in the swamp.